They evolve and persist only in permafrost – “ground that is frozen for at least two years” – that is continuous and ice-rich – where “the volume of ice in the ground exceeds the total pore-volume that the ground would have under natural unfrozen conditions” (Harris et al., 1988). Most often, they occur where “ice-rich” permafrost has undergone thermal destabilisation and thawed, forming a thermokarst lake. If and when a thermokarst lake loses its water during warm periods, by drainage or evaporation, then during subsequent periods of cold the previously unexposed lake-basin will begin to freeze. As permafrost aggrades from the lake margins in and from the lake-floor down, pore water migrates away from the freezing front (under hydrostatic pressure) and begins to deform the basin floor upwardly at the basin centre. This is where the aggrading permafrost that overlies the pore water is particularly thin and weak. Eventually, the pore-water freezes, creating an ice-cored mound. Often, polygonised terrain, formed by thermal contraction and underlain at polygon margins by ice-wedges, cross-cuts the permafrost that surrounds and overlies the pingos. Image 2. Small CSP-like mounds on a crater-floor (67.1710N, 47.4850E). HiRISE image ESP_017090_2475 (courtesy of NASA/JPL/U of A) overlain on CTX image P16_007372_2474 (courtesy of MSSS/Caltech/JPL). 10m contours are derived from a 1m/pixel DEM produced from HiRISE images ESP_017525_2475, ESP_017090_2475. The crater-floor locations of mounds A-C, whose cross-sections are presented in the bottom sub-image, are indicated by insets in the right sub-images. DTM created by the NASA RPIF3D facility at the UCL. Balme, M.R., Gallagher, C., (2009). An equatorial periglacial landscape on Mars. Earth and Planetary Science Letters 285, 1-2, 1-15, dx.doi:10.1016/j.epsl.2009.05.031. Burr, D.M., Soare, R.J., Wan Bun Tseung, J.M., Emery, J.P., (2005). Young (late Amazonian) near-surface ground-ice features near the equator. Icarus 178, 1, 56-73. dx.doi.org/10. 1016/2005.04.012. Burr, D.M., Tanaka, K.L., Yoshikawa, K., (2009). Pingos on Earth and Mars. Planetary and Space Science 57, 5-6, 541-555. dx.doi:10.1016/j.pss.2008.11.003. de Pablo, M.A., Komatsu, G., (2009). Possible pingo fields in the Utopia Basin, Mars: geological and climatological implications. Icarus 199, 1, 49-74. dx.doi.org/10.1016/j.icarus.2008.09.007. Dundas, C.M., McEwen, A.S., (2010). 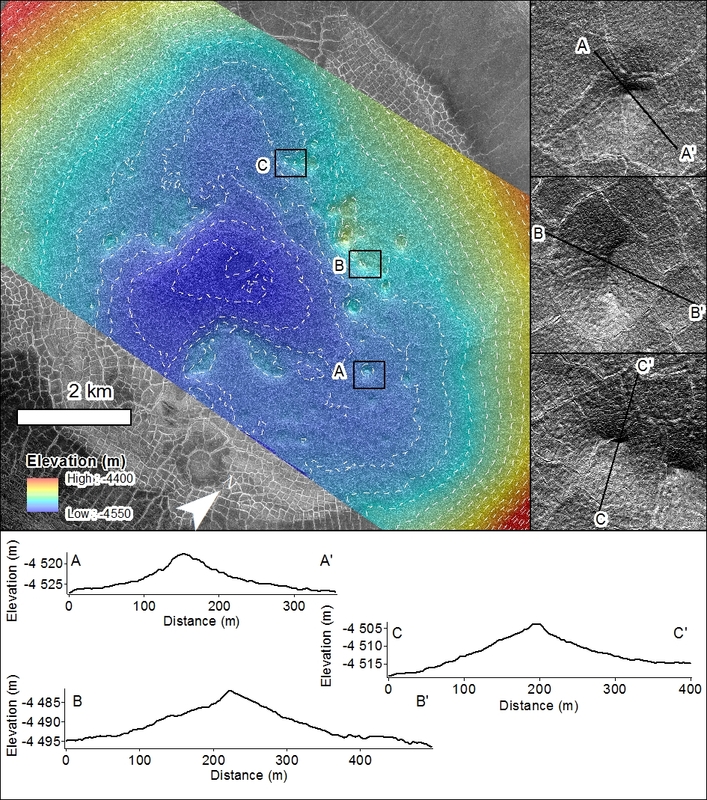 An assessment of evidence for pingos on Mars using HiRISE. Icarus 205, 244-258. dx.doi.org/10.1016/j.icarus.2009.02.020. Harris, S.A.., French, H.M., Heginbottom, J.A.., Johnston, G.H., Ladanyi, B., Sego, D.C., van Everdingen, R.O., (eds. ), 1988. Glossary of permafrost and related ground-ice terms. Technical Memorandum 142, Permafrost Subcommittee, National Research Council of Canada. Mackay, J.R., (1998). 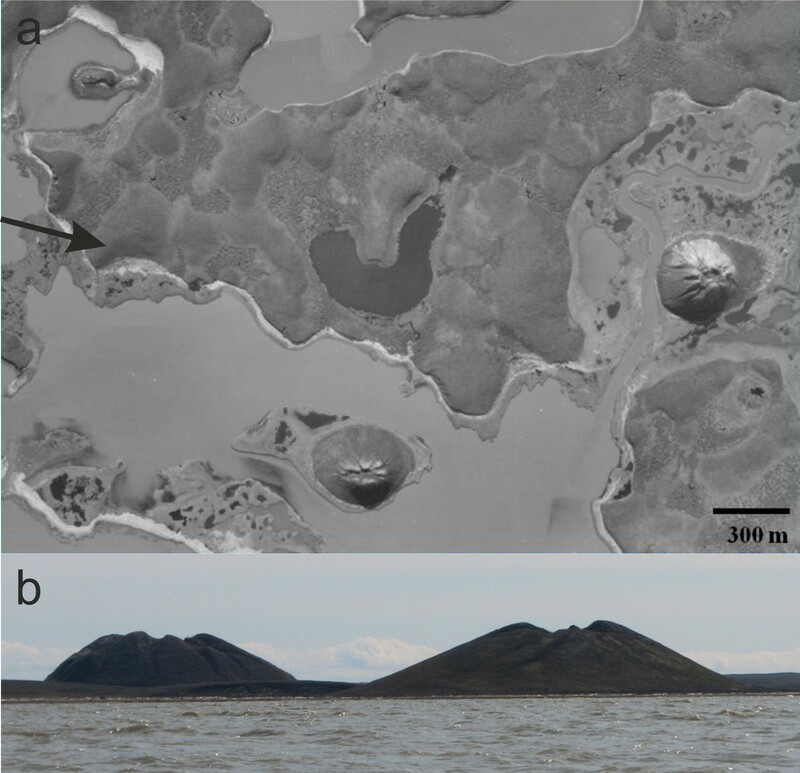 Pingo growth and collapse, Tuktoyaktuk peninsula area, western Arctic coast, Canada: a long-term field study. Geographie Physique Quaternaire 52, 3, 1-53. Müller, F., (1959). Beobachten über pingos. (Observations on pingos), Meddelelser omGrønland 153, 3, 127. Reprinted as Technical Translation 1073 by National Research Council of Canada, Ottawa, Canada, 1963. Page, D.P., Murray, J.B., (2006). Stratigraphical and morphological evidence for pingos in the Cerberus Plains. Icarus 183, 1. dx.doi.org/10.1016/j.icarus.006.01.017. Soare, R.J., Conway, S.J., Pearce, G.D., Dohm, J.M., Grindrod, P.M. (2013). Possible crater-based pingos, paleolakes and periglacial landscapes at the high latitudes of Utopia Planitia. Icarus, dx.doi.org/10.1016/j.icarus.2012.08.041, VOL. 225, Issue 2. Nice article about possible ice-cored mounds on Mars (but should the title say ‘Closed’ as these are hydrostatic and drawing on the local water reservoir, rather than the lateral seepage that typically feed ‘open’ (hydraulic) systems. They do look pingo-ish, but full diagnosis as pingo or lithalsa (palsa) or some other form will probably some other imagery (any radar penetration? maybe something thermal for summer/winter variability?) and/or field investigation (not sure I’m willing to volunteer for that until the rocket scientists have got both the ‘there’ and ‘back again’ parts of the journey worked out!). The cross sections look a bit peaked for typical lithalsas, but there could have been slumping or thermokarst subsidence. This work reminds us that many of the geological/geotechnical processes we observe on Earth can happen elsewhere. If these are ice-cored mounds, they could be a resource for use in future exploration of Mars. No doubt, the ice will be salty, but a bit of straightforward water treatment should deal with that.